It was Garry’s little brother’s birthday on the 7th November. I say little brother; he’s five months older than me and was 21. Yay Stefan! 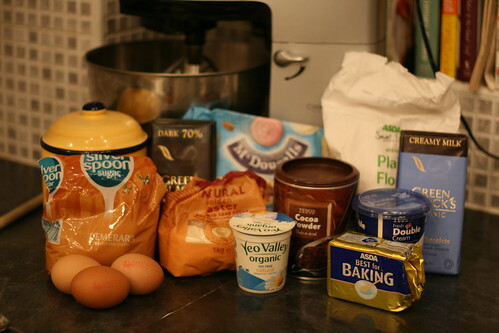 Anyway, I decided as part of my sister-in-law duties I should make him a cake. I didn’t want to do a quick sponge though; it’s Stef’s 21st and I wanted to do something special. 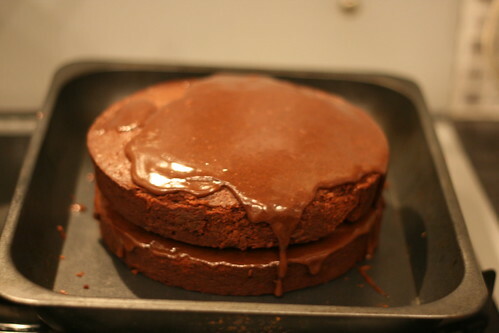 When I found this amazing recipe on the BBC Good Food website for the Ultimate Chocolate Cake, I knew I had to do it. To prep, grease your cake tin. 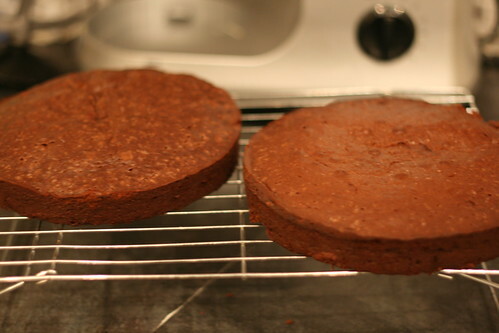 The recipe called for a 20cm round cake tin that was 7.5cm deep and then the cake would be cut into 3 when cooked. I have absolutely no trust in my cutting-cake-in-pieces-widthways skills, so I used two shallower cake tins instead. While the chocolate is melting you can mix together the flours, bicarbonate of soda, sugars and cocoa. The recipe recommends doing it with your hands. Then beat the eggs in a bowl and stir in the buttermilk. I didn’t know where to get buttermilk so, on the advice of the commenters, I used natural yogurt. 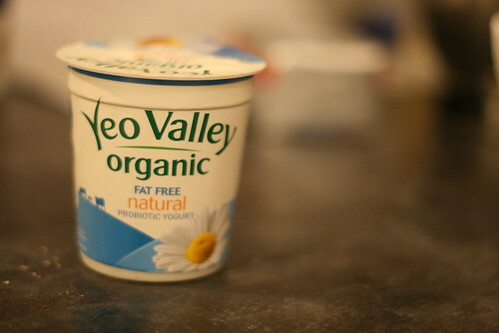 Yeo Valley. Yes I bought it purely because of the advert with the rap. Yes it’s very nice. Let’s move on. 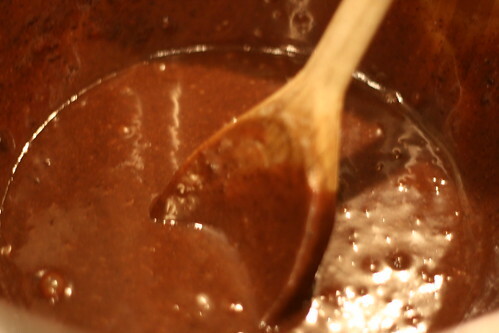 Pour the melted chocolate and the eggs into the flour/sugar mix and stir until everything is well blended. It should be smooth and fairly runny. It should also be FLIPPING LOVELY. I tasted a little and it was absolutely lush. Pour the mix into the cake tin. The recipe said it should be baked for 1 hour 30 minutes, but as I used two tins it was done in an hour (I swopped the tins over at 30 mins). When it’s ready, a skewer inserted in the centre will come out clean and the top will be firm. Leave it in the tin; when it’s totally cool turn it out onto a wire rack. If you used one cake tin, cut it lengthways into two or three. Now to make the ganache. Chop the chocolate into small pieces and tip into a bowl. I actually used milk chocolate for the ganache because I read in the comments that it stopped it from being too rich. 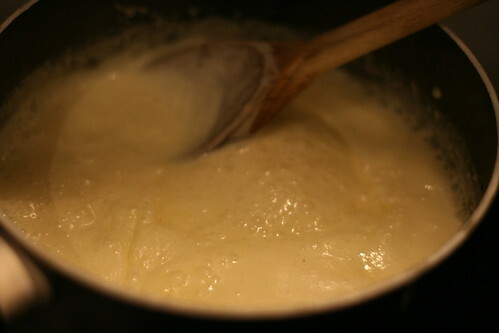 Pour the cream into the pan with the sugar and heat it until it’s just about to boil. Do not get distracted by the TV and wander into the living room whilst the cream boils. Boiling double cream is very odd. There’s about 200 photos of me doing that; it was fun. 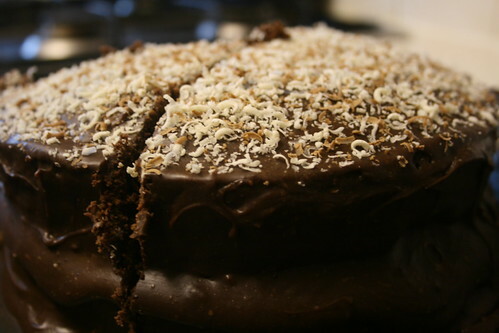 Use a little bit of the ganache to sandwich all the layers together. Pour the rest over the top let it dribble down the sides to ice it. This was a bloody nightmare. It just wouldn’t set. I had a spatula and spent a good half hour just smoothing it down and round the sides, but it was too runny. Eventually I stuck it in the garage for 20 minutes to cool down, when back when it was slightly firmer and smooth it again. I grated a mix of white and milk chocolate over the top to decorate, and left it in the garage all night. As birthday cakes go, it was rather lovely. It wasn’t eaten the first day I made it; when it was eaten it had gone slightly stale but it was still lush and fairly gooey. With whipped cream it tasted perfect. A genuinely gorgeous cake. Stef seemed to like it anyway. And Garry certainly did; we were still eating it six days after I first made it. 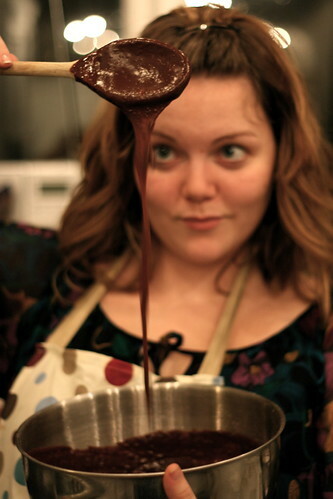 If you want some more pictures of me making the cake, there’s a Flickr photoset here for you to have a gander through. If you need any help or have any questions making it just let me know, or check out the comments on the bottom of the recipe page as loads of problems have been solved there.